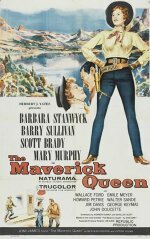 Western starring Barbara Stanwyck. Kit Banion's saloon is a haven for notorious outlaws such as Butch Cassidy and the Sundance Kid. When a gunman claiming to be Cole Younger arrives in town, Banion falls for him, little realising that he is in fact an undercover Pinkerton detective with orders to arrest the Wild Bunch gang.